Amelia Abercrombie, Doctoral student in Language Based Area Studies at the University of Manchester, reports on her NWDTC-funded fieldwork in Kosovo. 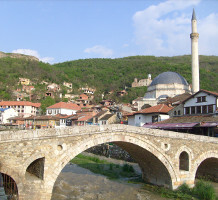 I’ve recently come back from 18 months of fieldwork in Prizren, Kosovo, where I’ve been researching multilingual Roma – who speak four languages, Romani, Albanian, Serbian and Turkish. On a daily basis they switch between languages, sometimes mid-sentence. I wanted to find out what was going on here – why do they use one language in one context but not in another context? What happens when you mix two unrelated languages together? How does language use reflect political hierarchies and tensions? My research touched on a variety of issues such as multilingualism, code-mixing, and the politicisation of language. Kosovo is an extremely complex site for researching language use, as it used to be a fairly mixed area, but since the ethnic conflict between Serb and Albanian forces in 1999 it has become much more segregated. A process of unmixing has meant that most parts are almost exclusively Albanian or Serbian. Roma are in a particularly precarious position as it is often assumed they sided with the Serbs in the war. As such many Roma fled to Serb areas, and Romani language itself is in decline in some parts. In Prizren, however, some of this mixture persists. While the vast majority of the Serbian population was forced to leave, there are still Turks, Bosniacs, Gorans, Roma and Ashkali, as well as Albanians. When people from the town talk about their town they tend to emphasise, and even glorify this mixture of groups, and emphasise their tolerance. It is still common to hear people using and mixing four languages in the town. My original plan was to learn Romani by living with a family, which I did for nearly three months. For various reasons beyond my control this didn’t work out, and I moved into a flat. Language learning was still a central part of my fieldwork, but I did it by volunteering at the Romani language radio station and NGO, at Romani language classes, and generally chatting to people around the town. So I was using language learning as a form of participant observation which is a method which has been described as ‘deep hanging out’. While Romani language was central to my research, I was looking at the relationship between Romani and other languages, so I spoke to people of all ethnicities in the town, and also tried to learn some Albanian and Turkish. My idea to live in the Romani quarter and learn Romani with a view to learning how they mix languages did not go to plan. The time I spent in the Romani quarter was interesting, and helpful, but not long enough to actually get to grips with the complexity of how people mix languages in the Romani quarter. However, my volunteer work at the Romani language radio station, which I had originally suggested I would do as a way of paying back the people I had hoped to live with opened up a whole new area of research: language standardisation. Romani language has no one unified standard, and exists across a large area, with a variety of dialects and contact languages. For a long time it has been considered as a language limited to the home, or to Romani quarters, but the use of Romani at this radio station challenged this. My colleagues were part of a process of standardising the language, and making it into more of a public language. By working there for a long period I was able to see the kinds of choices people were making about their language on a daily basis, as well as the debates and arguments the went behind this choices. As such the process of Romani language standardisation, in a multilingual setting became a central focus of my research.